Ok, so on a boat I am limited as to the number of supplies and ingredients. Plus without a car, driving to the nearest grocery store is not an alternative. The fridge is the size of a small cupboard and fresh fruit and veggies end up in a cool corner of the boat or on the table. By the third day, I need to get my creative juices flowing in order to save them. Throwing away food is not an option on this boat or at home. As I stared at the fruit in the bowl on the table my mind worked for a few days and then BAM! I decided to whip up a Buttery Banana Bread with the ingredients I had on board. This is an amazing banana bread made from 2 “mature” apples and 2 “mature” bananas. I found some dates I used for making brownies, some raw coconut, walnuts and some organic cranberries. If you ever buy organic cranberries you know they’re sour as heck. Plus there’s no added sugar to this soft warm delicious bread. The apples, bananas and the few dates were the right amount of sweetness for us. 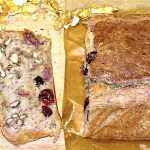 You can adapt this basic recipe and add what you like in the Goodie section. 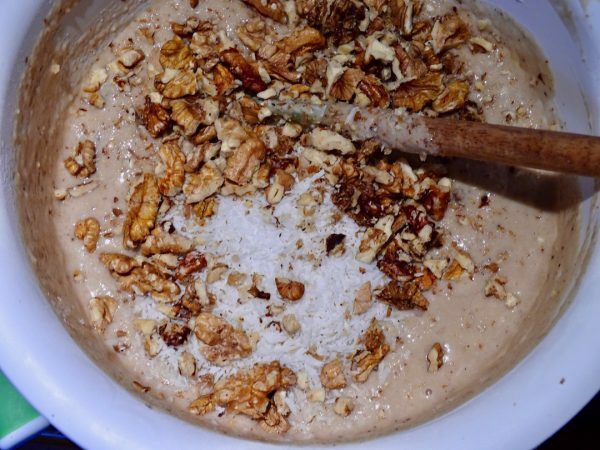 If you’re not eating nuts then replace the almond flour with rice flour and omit the walnuts. I used a toaster oven to cook this loaf and it took me 1 hours on 170 C or about 375 degrees. It’s so good with fresh French butter from the farm…holy moly. What a treat on these cloudy days on board. 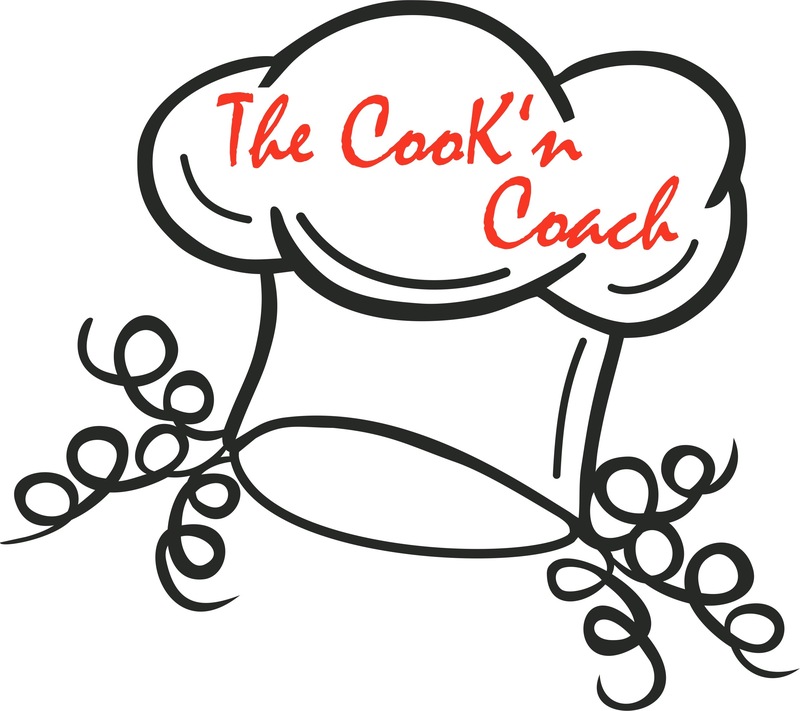 Heat the oven to 375 degrees or 170 c. Oil the inside of a loaf pan with ghee or coconut oil. 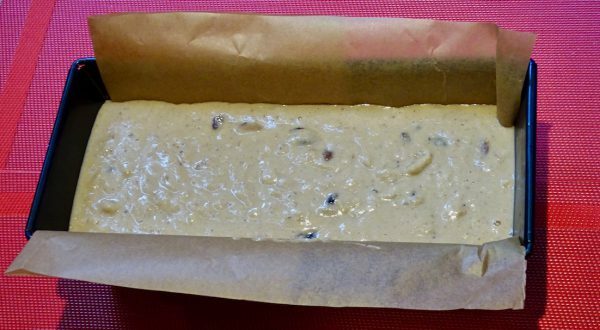 Check out below how I used the baking paper to line the pan. It's so much easier to lift the bread out to cool. 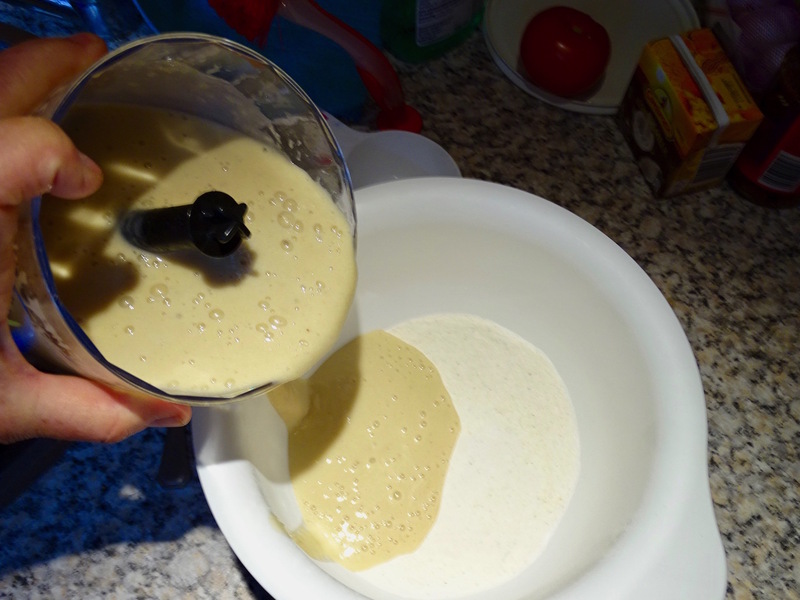 In a medium bowl whisk with a fork all the dry ingredients and set aside. Simmer the apples until tender and mash into applesauce. Let it cool down a bit. 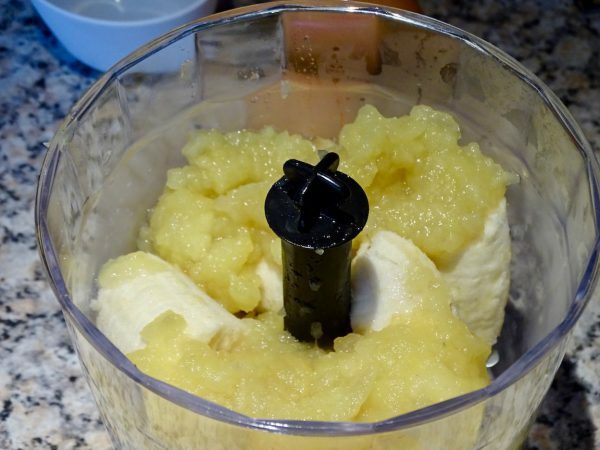 In a food processor or in the attaching bowl that comes with your immersion blender add the bananas, eggs, apple cider vinegar, melted coconut oil or ghee, vanilla and cooled apples. Blend until smooth. 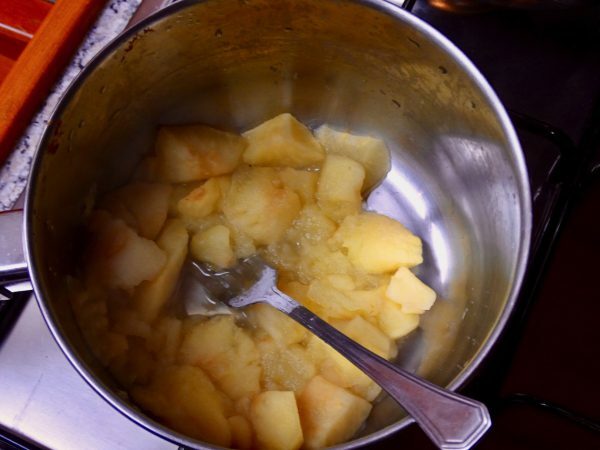 Slowly pour the apple and banana mixture into the dry ingredients and mix with a spoon until creamy and smooth. Add the Goodies of your choice and mix with a spoon. Pour into your lined loaf pan and bake for 50-60 minutes. Check with a knife in the middle to make sure it is done. If the knife comes out clean then it is finished. Let the loaf cool for 15 minutes then use a knife to separate the ends of the loaf from the pan and use the baking paper to lift the loaf out of the pan and place on a rack or try to cool. Make sure it has cooled at least an hour before slicing into this baby. It is very moist and a serrated knife works best. Top with fresh butter or just eat as is. 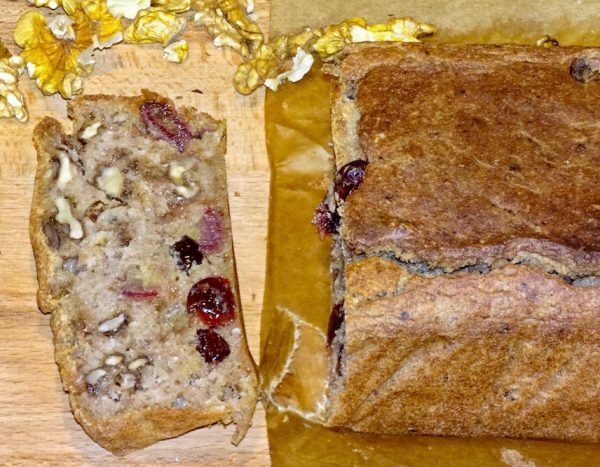 Tip: This delicious bread is so good in the morning! We put it in the toaster oven and warm it up for 5 minutes. Super great for 4:00 tea time as well.